raymond from matamata-piako, Greg from Ashburton & 27 others bought this item recently. 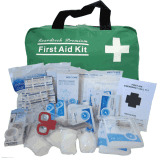 Vehicle & Lone Worker First Aid Kit 30 Piece. It provides basic first aid coverage and is compact enough to easily fir into a glovebox or boot. For a more comprehensive vehicle first aid kit, you could also view our Comprehensive Vehicle First Aid Kit. We are sure that you will be satisfied with your purchase and we offer a MONEYBACK GUARANTEE. Heavy Duty Waterproof Bag with internal pockets. The 4 separate transparent compartments fold out so you can easily see all the contents at a glance. The packs arrived safe and undamaged. The whole process was very quick and efficient – much appreciated. Great product, just what we needed for our vehicle and at a good price, thank you!